At Villa Montessori Preschool, we believe you should get everything you expect from childcare, in a slightly less ordinary way. You’ll find our unconventional approach at Villa Montessori Preschool not only inspires your child, it also inspires you as a parent. Although we serve as a reliable daycare provider, your child experiences so much more at Villa Montessori Preschool. 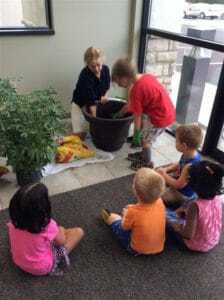 We follow a daily schedule that includes Montessori and Reggio curricula guided by your child’s interests. Children are exposed to music, gardening, animals, art, outdoor play, and more on a daily basis. Our teachers observe and get to know each child. They identify the topics he or she is most interested in and presents new learning opportunities accordingly. 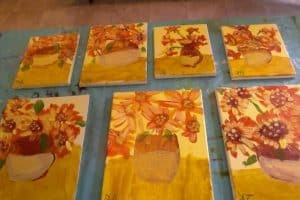 Interpretation of Van Gogh’s Sunflowers by 3-5 year olds! We partner with you – not just as a childcare center, but also as an extension of your family. Providing the highest level of care and an education tailored to your unique child is the idea behind everything we do. So relax and embrace the journey of parenthood. Gift your child with a unique preschool experience!